There are millions and millions of people suffering mental disorders such as bi-polar, schizophrenia, and major depression. As a result they are hearing racing thoughts and the thoughts are constant everyday. Evil spirits are telling these people lies. According to the scriptures, they are hearing dreadful noise from familiar spirits declaring doom and gloom. Wise men have talked about this even before the times of Job. Burning unauthorized defiled fire is the catalyst of a disturb mind and health issues affecting the body. 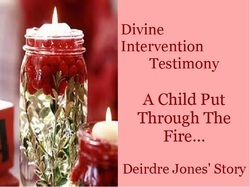 Deirdre shares her story of the effects of being put through the fire as a child.